Plumbing is an essential part of any commercial and residential building. When it is working properly most people do not give much thought about it. When things go wrong then they start to think about the plumbing in the their home or work place. For minor plumbing problems some will consider fixing things by themselves yet this is not particularly a good idea. If messed with by untrained hands a relatively minor problem can cause considerable amounts of damage. In reality people that encounter plumbing issues or problems should hire professional Plumbers in Chandler, AZ to sort everything out for them. In this area our company are the most effective plumbers that can be hired. Our company has been trading within this district for many years now, and in that time we have had many satisfied clients. Full training is provided to all of our staff, and we only hire those that hold all of the relevant qualifications, or are in the process of completing their vocational training. Plumbers in Chandler, AZ need to have full knowledge of working with gas or electric as well as plumbing. It is best that all of our staff can work with both gas and electric so that we are able to offer the fullest possible range of plumbing services. That in turn means that we are able to help the maximum number of clients with any plumbing work and issues that have to be dealt with. All of our plumbing staff are fully equipped and able to operate by themselves or as part of a larger team. 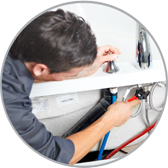 We are capable of sending out any of our plumbers out to clients right around the clock. Our top notch Plumbers in Chandler, AZ are only a phone call or one online page click away for clients.